Jave Yoshimoto is an artist and educator of multi-cultural background. He was born in Japan to Chinese parents and immigrated to the United States at a young age. He has since traveled and lived in various parts of the country which influenced his artistic practice. He believes in creating art works that are socially conscious and true to his authentic self. Similarly in his teaching philosophy, he encourages his students to explore their personal identity and experiences to put into their creative compositions while developing their technical skills. He has experiences working as an art therapist/mental health professional in Chicago, IL, as well as being a painting instructor at Syracuse University and as a teaching artist in Seattle, WA. He has worked with various age groups and diverse ethnic populations in both rural and urban settings. As an artist, he served as an artist-in-residence at various artist colonies across the United States. Yoshimoto has been published on multiple publications and websites, received a letter of recognition from the United Nations, and exhibited works nationally and internationally. He has also shown in solo exhibitions in New York, Chicago, IL, Portland, OR, Seattle, WA, Alva, OK and Lincoln, NE. Yoshimoto currently works as an Assistant Professor of Art at the University of Nebraska-Omaha, teaching foundation level courses. My work takes on the ephemerality of news and information and how the emotions we bring to each tragedy in the news cycle are swept away by the wave of information that floods the media. I address this social amnesia through my art with the work acting as a social memory for tragic events so quickly forgotten in our information age. My development of “Godzilla invading U.S.” series led to eventual refinement of my painting techniques. What initially started out as mimicking and paying homage to Asian art history evolved into his own personal graphic technique. While “Godzilla invading U.S.” series focused more on my personal struggle as an Asian-American citizen, my following project, “Baptism of Concrete Estuary” allowed me to reconnect with the Japanese heritage that I struggled for many years to forget. “Baptism of Concrete Estuary” is the culmination of my knowledge and techniques. Through years of striving to find the means to articulate my personal vision, a process that I found moving from small to medium sized paintings to this monumental work. 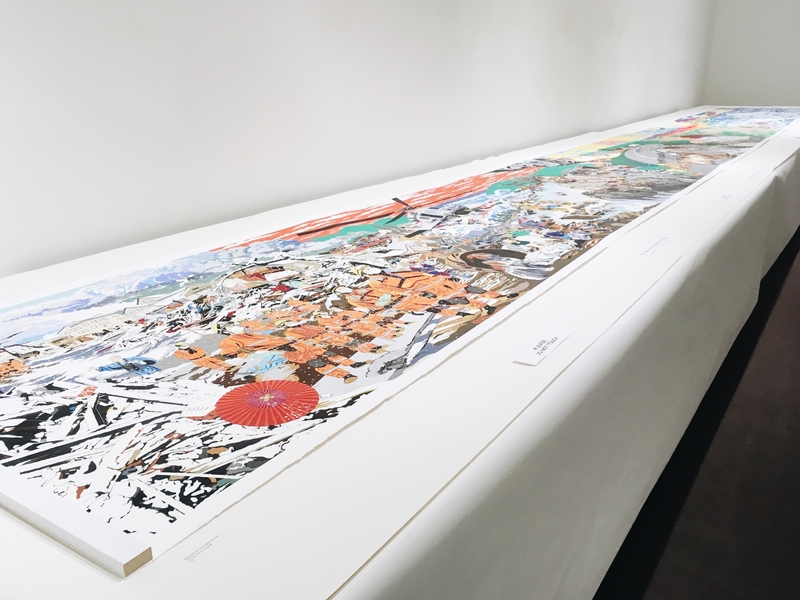 My intention in creating a 30 feet scroll painting was that the audience would be able to have an intimate look at the painting as in traditional Chinese and Japanese scroll, while also feeling overwhelmed by the massiveness of the paper in comparison to the individual. 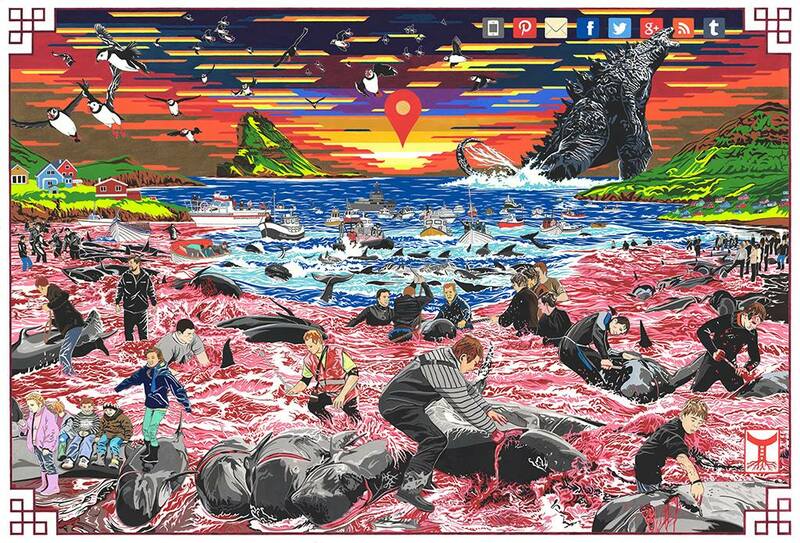 Employing images of the overwhelming power of the Japanese tsunami and earthquake to inspire empathy in the painting’s viewers. I used visual color blocks and large fields to draw in the audience for a closer view, while the finer details of the piece keep the audience fixated and allow them to feel immersed in the painting themselves. My works are intended to serve as a constant reminder that tragic events such as this should always be remembered, especially since there are those in Japan still in dire need of assistance. This gave birth to my current “Disasters (Sinking World)” series, which ultimately represent my belief that art should be accessible to its viewers through human tales of struggle and survival as played out in the prevalent social amnesia of the information age.